Located in Tulette, Les Rives de l'Aygues is a 3-star family campsite with swimming pool in Drôme Provençale. Nestled in nature, the establishment welcomes you from April to October in a quiet and relaxing, bordered by a river in which campers take pleasure in cooling off, or on its banks, to indulge in the joys of spades -nique. Our campsite offers a secure swimming pool with a paddling pool and a children's play area, petanque courts, areas reserved for table tennis, but also a snack bar where you will find a quality catering. In summer, the Rives de l'Aygues team organizes theme nights with DJs, singers and musicians. 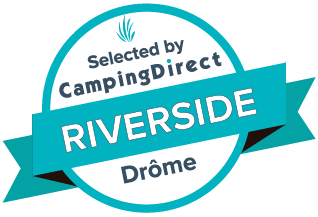 The name of our 3-star campsite in Drôme Provençale is unequivocal. As the name suggests, Les Rives de l'Aygues is a campsite located on the edge of a river, peaceful as soon as spring comes. Ideal for cooling off on hot summer days, or for a picnic with friends or family. Indispensable, the pool of Rives de l'Aygues welcomes you every day until 20h. Its heated pool 14 m long will allow you to do some lengths and relax. The children will enjoy having fun in the paddling pool and in the play area reserved for them. Our charming campsite in Drôme Provençale suggests you to eat at its snack bar, open at the campsite reception hours. Our team strives to offer every day a small catering quality including homemade pizzas. You will also be able to offer a refreshment, always appreciable under the sun.